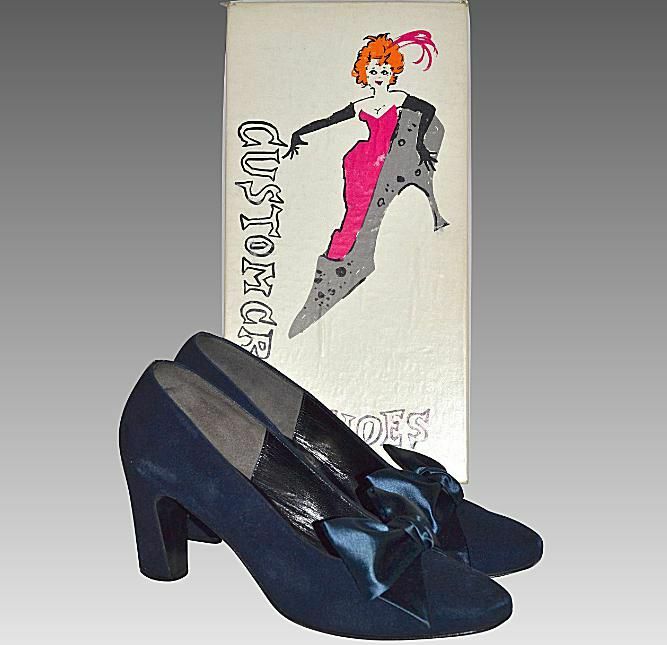 1960s Shoes with Original Box. While you might not fumble around in your closet each morning looking for collectibles, the fact is that many people do indeed collect old shoes. There are actually a number of good reasons to collect footwear, starting with functionality. Around the country, historical reenactment societies enjoy getting together for an afternoon of vintage finery. When these groups meet, the members dress true to a certain decade, right down to the accessories. This includes vintage footwear when it's available. Others prefer dressing in vintage clothing as more of a fashion statement. Shoppers frequenting antique shows, like City Wide Garage Sale in Austin, Texas, often look as if they stepped right out of a time machine. Whether it's a '30s, '40s or '50s look they're trying to achieve, they don the appropriate shoes to match their apparel of choice. There are other collectors who buy shoes purely for their unique style or decorative appeal. Footwear encrusted with rhinestones is always popular with fashion-conscious collectors. Shoes with fancy buckles, ornaments or embellishments appeal to this crowd as well. Displaying these types of shoes in a boudoir can make a beautiful conversation statement. One of the most important factors in shoe collecting is style. Stylish footwear clearly representative of a particular era appeals to both collectors and those buying shoes to complete a look. Designer brands also add value to vintage shoes in many cases. Most of all, vintage shoe buyers want their footwear to have some life left in them. They need to be in good to excellent condition to bring such high prices. The nature of shoes being worn until they are pretty much worn out makes them harder to find in pristine condition when compared to other vintage accessories. By and large, however, those who plan to wear their vintage footwear look for reasonably priced shoes. That's part of the appeal. Putting together a stylish vintage outfit can often be much less expensive than purchasing a comparable new one. And if frugal shoppers hit the right thrift stores and estate sales, they can usually achieve that goal with fun persistence that ultimately pays off. Wearing a stranger's used footwear is not everyone's cup of tea. But there is good news - shoes make interesting decorative accents so do not pass up a reasonably priced pair you like just because you have no intention of wearing them. When completing the look of the vintage boudoir, having a pretty cocktail dress hanging over a door or outfitting a dress form with a colorful frock can be a nice touch. The matching shoes make the display complete. Old high button shoes look great perched atop a chest in a bedroom decorated Victorian style. Decorators with a more modern view of life can find funky boots from the '60s and platform disco shoes of the '70s that make quite a statement in the right atmosphere, too. As a go-with collectible, advertisements featuring everything from wingtips to saddle oxfords taken from old magazines can make a nice addition to a bathroom wall when appropriately framed. Not to mention the conversational value of these ads, especially for young members of the family who don't remember the fashionable styles worn by their grandparents and great-grandparents. If none of these ideas sound appealing, how about a few glass or porcelain shoes to liven up your home. Back in Victorian times, these items were called "whimsies" because they served no useful purpose. You can still find a few older shoe-shaped whimsies here and there in antique shops. If amassing more dust-catchers does not appeal to you, items shaped like shoes have taken the form of most everything you can imagine from brooches to telephones over the years. Some were bigger than the real thing, including incredible chairs shaped like bombshell high heels in leopard print fabric. Others were fashioned in miniature including samples carried from shop to shop long ago. All were produced in a variety of materials, including plastics.